A native of Void, Lorraine, a military engineer, was initially recruited by the Austrian Army. He was an expert on fortresses and wrote two books on fortifications. Upon his release from the Austrian Army, he became a teacher at the Arsenal in Paris. Under the direction of General Gribeauval, and the duke de Choiseul, Nicholas Cugnot designed and directed the manufacture of a self-propelled carriage, which was tested in 1769. Following this successful experiment of a self propelled carriage, de Gribeauval set forth the specifications for a second prototype. 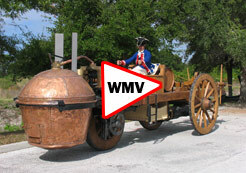 The speed of this vehicle, was set to be 3 miles per hour, in order to follow the army on foot. The load was 5 tons. The second prototype “fardier “ number two, was designed to have enough autonomy to avoid stopping every 15 minutes to add water, as was the case with the first prototype. Michel Brezin, mechanic and entrepreneur in Paris, worked with Cugnot. De Gribeauval ordered cylinders and pistons from the Arsenal in Strasbourg in April 1770. The steam carriage was targeted for its first trial in November of the same year. Louis Petit de Bachaumont, French litterateur published three memoirs (les memoires secrets) between 1769-1770. 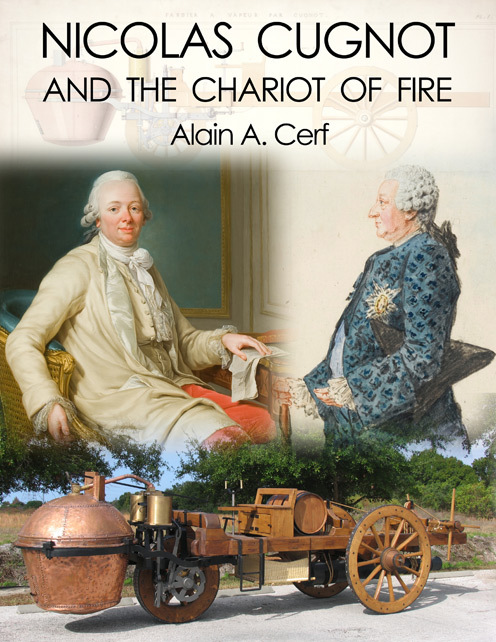 In his last memoir, he reported on the performance of “fardier’s” (number two) speed and load. The steam carriage had the capacity to run, non-stop, for an hour and 15 minutes. Shortly after this first experiment, the Duke de Choiseul was fired from his post as Foreign Minister. De Gribeauval and the Young Turks fell into disgrace, the Old Guard was back, and the Cugnot project was scrapped. The original “fardier” is presently on display at the CNAM – Musee des Arts et Metiers in Paris. It is in fairly good condition; some parts were replaced in the 19 th century. It is a museum piece and deserves the best of care. It is impossible to run the “fardier”, even after some fine tuning, the wheels are very fragile. Many doubted and continue to doubt the ability of the “fardier” to run properly. It continues to look like an experiment of the first self- propelled carriage. In contrast to its mechanical parts, the boiler is , in fact, of very poor design. It looks similar to the 1769 boiler, which could not supply steam for more than 15 minutes. It is reported that an accident was to have happened when the "fardier" went out of control and demolished the second boiler. Conceivably the first automobile accident! If we accept the premise of the accident, cited for the first time in the obituary of Cugnot in 1804, we can imagine the old boiler being reinstalled on the fardier in order to continue testing, while waiting for the better boiler to be repaired. Today, the fardier is a curiosity, with very few people believing it as a great piece of engineering. The Mid 18 th century (siecle des lumieres), The Age of Enlightenment, is known for famous philosophers, but it is also known as a century of great engineers. General de Gribeauval, Commander of the French Artillery, is credited as the earliest known advocate for interchangeability of gun parts. Standardization became his top priority, starting with a limited number of arsenals and next with the manufacture of guns with close tolerances. Parts coming from an arsenal in the south of France could be used on guns manufactured in the northern part of country. The “fardier” was born from this new spirit of rationalization and standardization – a very modern idea in the 18 th century. The idea was to replace horses, which at that time hauled the guns, by self propelled tractors. The department of Defense funded the project. This museum dedicated to automobile engineering and to the progressive automobile engineers, is sponsored by POLYPACK Inc., a manufacturer of packaging machines in Florida. Advanced Engineering, as practiced by POLYPACK, leads to curiosity about the engineers and the engineering of the past. The best and only possible way to test the ideas of Cugnot is to make a replica of his "fardier" at a scale of 1/1, following with the greatest of care to meet all the technical specifications. At first, the Tampa Bay Automobile Museum borrowed a replica of the “fardier” from the Deutsche Bahn Museum in Nuremberg. It was made for a movie. The replica is of the right scale, but the engine is a fake. With approval of the Deutsche Bahn Museum, a new steam engine, an exact copy of the original engine in Paris, was made by POLYPACK Inc. In Florida and installed on the “fardier” It is the "fardier" of this video. Steam was replaced by compressed air, awaiting the final phase of the project, when a brand new "fardier" will host the present engine and boiler for the production of steam. Cugnot’s "fardier" runs very well; the high pressure steam engine, the first in the world, runs very smoothly even if each piston applies a pressure of one ton. The valve mechanism is very easy to adjust. The "fardier", when set in motion, can come to a complete stop without any external aid. This 1770 steering is rack and pinion and requires minimal strength to steer. Nicholas Cugnot was not a dreamer but a very good engineer. 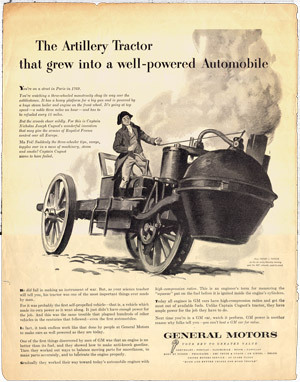 The “fardier” and his modern steam engine deserve a better future. Unfortunately, good ideas and good workmanship are no guarantee of success. This rule still holds true today. We thank the Conservatoire des arts et Metiers in Paris for their cooperation.